Today’s guest Blog is by Sam Hill, of Run An Empire, winners of the How can we encourage active lifestyles in Britain? Challenge. 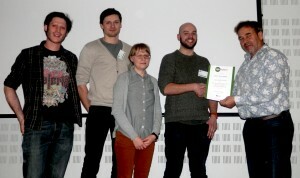 The Hoxton based, PAN Studio were awarded £26,000 to develop their idea. 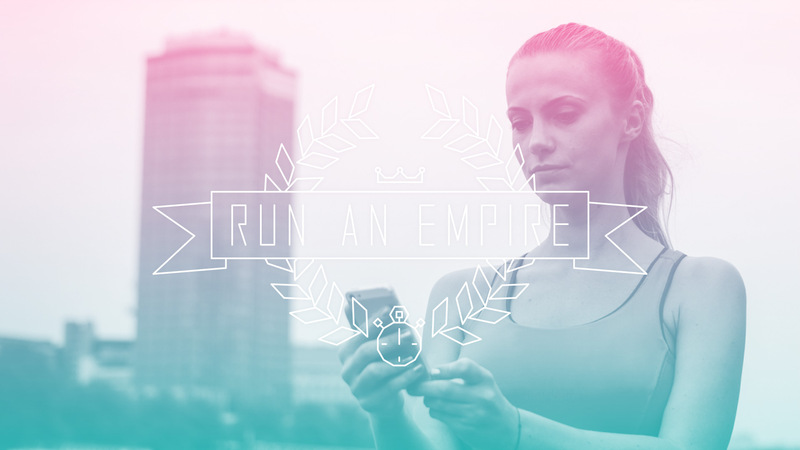 Run an Empire is an exercise strategy game on a smart phone app, which uses GPS with Ordnance Survey data to record paths players take and allow people to compete to capture and maintain control of as much territory as possible, using neighbourhoods as arenas for play. The more times people run or walk around their neighbourhood the more secure they can make it against ‘invasion’. Ben Barker and I started our experience design practice PAN Studio three years ago. We started with a shared desire to apply critical design thinking and technical knowledge to create new kinds of enriching, playful experiences. Since then we’ve worked on loads of fun and stimulating projects for clients, commissions and organisations – including Hello Lamppost – a project that encouraged people to converse, over text message, with street furniture. However, it wasn’t until the beginning of 2014 that we seriously decided we wanted to develop our first product: Run An Empire. Spurred on by our experience with Hello Lamppost we wanted to see what else could be done playfully when digital technology meets public spaces. 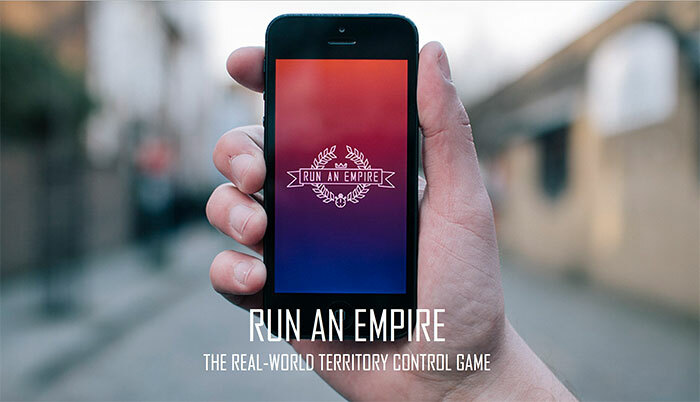 Run An Empire is a strategy game for mobile devices where players compete to run around and capture places in the real world. The idea started off purely as a game mechanic (it still is for the most part) – we were a bit disappointed that a lot of pervasive games for mobile devices (games that take place in the everyday world, as part of our everyday life) still amounted to a degree of button mashing – albeit button mashing whilst stood in particular places. What we wanted to do was take the physicality of the real world and put it into a digital game; so that people had to move around and do things and hopefully earn a greater sense of reward when something paid off. From there it was a relatively small leap to see there were implicit health benefits to playing such a game, and that these might be a further motivator for people to play. The first time we put the idea into the public realm was for the GeoVation challenge submission process. It seemed like a perfect fit for us – here was a brief looking for solutions to sedentary issues using mapping technology, and there we were with an idea for a physical game that would need to use maps as a primary interface. We submitted our idea to the competition with subdued hope – it was late into the submission process, another seventy ideas or so had already been entered alongside ours and several of them had gained a lot of attention. So it was all the more exciting when we received a message from the GeoVation team saying we had been selected to attend the GeoVation weekend camp. We packed our stuff and headed over to Southampton for the weekend. It was great to meet the Ordnance Survey team, all the other attendees discussing their ideas and the Ordnance Survey building was a beautiful space to be thinking and working in. The weekender was great for us – we were priming for a Kickstarter launch at around the same time and it really helped us get our ideas straight and our communication aligned. The NoNon team and judges helped cast a critical eye over our business plan to make sure we could make something self-sustaining. By the time it came to presenting our idea to the crowd at the end we were well rehearsed and feeling pretty excited about the potential our idea had. It was thrilling when we were later selected from the finalists for funding and it gave us an enormous boost of confidence, which we were able to carry into our Kickstarter campaign. The knock on effect meant we smashed our target and since then we’ve been busy (so very busy!) designing, developing and test. Now, months on, we’re inching our way to an imminent beta launch of the game. We have an alpha version working and are putting all of our efforts into getting a testable version into the hands of our Kickstarter backers. It hasn’t always been a smooth journey (and it’s far from over yet) but it’s been an unparalleled learning experience for the whole team and something we’d do again in a heartbeat. The GeoVation team has been invaluable in their support and undoubtedly without their help we’d be in a very different position right now (in all likelihood much further behind). For that, on behalf of everyone at PAN Studio, I should say we’re eternally grateful.